Please email Emily McCauley at esdean@olemiss.edu to be added to the waitlist. This is a workshop for artists who are interested in learning to paint in the realistic style of the Dutch and Flemish still life painters of the 16th and 7th century. Participants will learn how to see, draw and paint objects in realistic detail. Subject that will be painted during workshop. 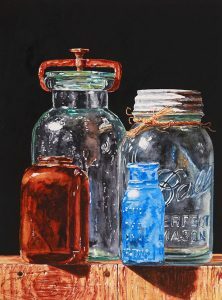 Participants will paint a simple still life of clear glass from a photo provided. Participants will use a projected image to trace the still life on to their paper. Laurin will teach the British, Two-Brush technique of how to make things look round and three dimensional. He will also share information about the history of realistic still life painting and its current popularity in the world market. You will also learn to create deep black backgrounds. Participants will learn about various techniques of painting realism. These techniques can apply to many types of subject matter. The goal is to learn a lot and enjoy the journey. Watercolor paper will be provided, participants will receive a separate material order list prior to the start of this course.